This maybe just a coincidence but yesterday, both Apple CEO Steve Jobs and Microsoft Chairman Bill Gates published lengthy essays sharing their thoughts on DRM and Security respectively. Steve Jobs urged the music companies to start selling songs without copy protection software (to boost sale of music on iTunes store) while Bill Gates detailed the work being done at Microsoft on trustworthy computing. The interesting thing to note was how the web reacted to the thoughts of these stalwarts which went online around the same time. 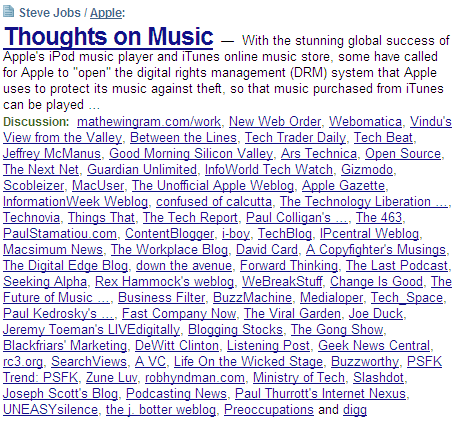 Steve Jobs' "Thoughts on Music" created a virtual thunder-storm as these screenshots from Techmeme, Digg and Technorati suggest. On the other hand, nobody even submitted Bill Gates' memo on Digg. And at the time of writing this post, only six blogs were linking to the Bill Gates letter and it never hit Techmeme.